As we learned before that ICMP was designed as a way to send error and diagnostic messages in an IP inter-network. ICMP messages are identified by “type” numbers. Each ICMP message also has a “code” number, which specifies a particular error code for that message type. How ICMP Messages Are Sent? Let’s use the same scenario before as shown in the diagram below. If Gateway E cannot pass the packet to the next Gateway (for example, Destination Host Unknown), it will send back a ICMP message to computer A. 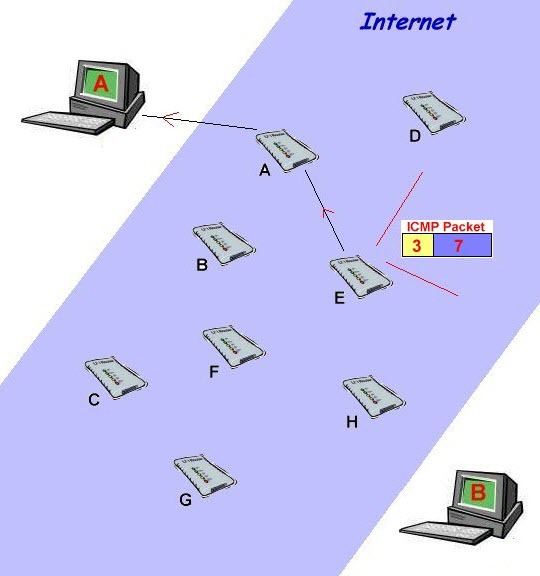 The ICMP TYPE is 3 – the error type indicating that the destination computer A is unreachable. The ICMP CODE is 7 – the error code indicating Destination Host Unknown. Actually ping is based on ICMP. The ping command is the most basic tool for testing IP connectivity. Ping uses timed ICMP Echo Request (Type 8, Code 0) and Echo Reply (Type 0, Code 0) packets to measure the transmission delay to a remote system. When an IP host receives an Echo Request message, it should send an Echo Reply packet in response. The ping program measures the number of milliseconds between the sending of an Echo Request and the receipt of an Echo Reply. This allows one to verify both latency and end-to-end connectivity with a particular IP host. I will discuss PING in more details later.